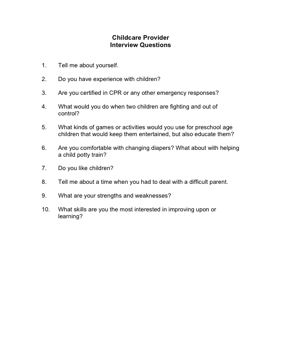 Choose your next Childcare Provider with the aid of these helpful interview questions. 2. Do you have experience with children? 3. Are you certified in CPR or any other emergency responses? 4. What would you do when two children are fighting and out of control? 5. What kinds of games or activities would you use for preschool age children that would keep them entertained, but also educate them? 6. Are you comfortable with changing diapers? What about with helping a child potty train? 7. Do you like children? 8. Tell me about a time when you had to deal with a difficult parent. 10. What skills are you the most interested in improving upon or learning?